Members of Congress introduce proposals to reduce or reverse cuts that outrage veterans in Maine and elsewhere. WASHINGTON — Under intense pressure from veterans’ groups, members of Congress are pledging to revisit a controversial provision of the weeks-old federal budget that would reduce pension payments for younger military retirees. The cuts to military pensions quickly emerged as the most contentious aspect of the two-year budget passed by Congress late last month. Since then, lawmakers have introduced a slew of proposals to reduce or reverse cuts that outraged veterans’ groups and active duty military personnel. “If they want to deter people from making the military their career, they are on the right track,” said Thomas Lussier, public relations officer for the Veterans of Foreign Wars in Maine. The two-year budget deal was touted by lawmakers from both parties as an important, if modest, first step toward avoiding another government shutdown and restoring a semblance of “regular order” to the federal budgeting process. The deal reduced sequestration spending cuts imposed in March by $63 billion, in part by trimming annual cost-of-living adjustments for younger military retirees. Under the plan, working-age retirees and some disabled vets would receive a one-percentage-point reduction in their cost-of-living adjustments until age 62. Upon turning 62, their pensions would jump to what they would have been without the yearly reductions. An estimated 800,000 people are affected, but the changes are not set to begin until January 2016, so lawmakers have time to work on an alternative plan. Three members of Maine’s congressional delegation – Republican Sen. Susan Collins, independent Sen. Angus King and Democratic Rep. Mike Michaud – said they opposed the military pension changes but voted for the budget compromise to avert a government shutdown. Each one has signed onto legislation seeking to restore the full cost-of-living adjustments for military retirees. Democratic Rep. Chellie Pingree of Maine opposed the budget deal, which terminated unemployment benefits for people who cannot find work for more than six months. The Pentagon expects to save $6.3 billion over a decade, money that supporters say will go back into the military by alleviating budget cuts. While it’s a relatively modest cut to pensions that are generous relative to those in the private sector, a 1 percent reduction adds up over a veteran’s lifetime. A sergeant first class or master sergeant who retires at age 40 after 20 years of service, for instance, would lose about $83,000 in earnings by age 62. A Navy or Coast Guard commander would lose $123,000, according to the Military Officers Association of America. Veterans groups have blasted those changes as a broken promise between Washington and the military community after more than a decade of war. 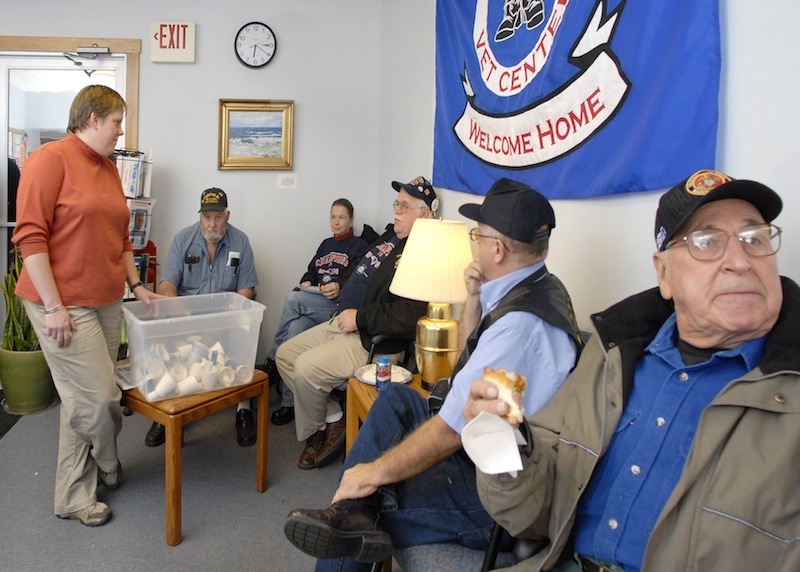 “It is a kind of stab in the back for a lot of people who planned their retirement” based on certain expectations, said Ronald Brodeur, adjutant of the Disabled American Veterans in Maine. “Some of these people who are going to be affected are people who deployed to Iraq or Afghanistan four or five times and have really paid their dues,” said Brodeur, an Air Force retiree who would not be affected by the changes because he is older than 62. The opposition from veterans and active-duty personnel was so strong that many lawmakers pledged to revisit the issue even as they voted in support of the budget deal. Congress had to rush to pass the budget deal before the holiday recess to avoid a government shutdown on Jan. 15. Republican critics of the changes tried to change the bill on the Senate floor. But with the House already adjourned for the year, Democrats and a few Republicans rebuffed those efforts. Democratic Sen. Patty Murray of Washington, and Republican Rep. Rep. Paul Ryan of Wisconsin, the co-authors of the budget compromise, have vowed to quickly correct what they said was an oversight that reduced pensions of disabled retirees and the spouses of those who died while serving. Lawmakers from both parties have introduced bills to reverse all of the pension cuts, and the two chairmen of the House and Senate Armed Services Committees have agreed to re-examine the issue. Ryan and Defense Secretary Chuck Hagel have defended what they say are modest cuts to military pensions. In an op-ed in USA Today, Ryan wrote that the cost per service member on active duty has risen 41 percent since 2001, even without including the cost of the wars in Iraq and Afghanistan. “For me, there’s simply no choice between responsible reforms of military compensation and making what our military leadership has called ‘disproportionate cuts to military readiness and modernization,’ ” Ryan wrote. All four members of Maine’s congressional delegation have signed on as co-sponsors of legislation to reinstate full cost-of-living adjustments for younger retirees, although the bills differ in how they would replace the $6.3 billion in savings. Nonetheless, Maine veterans have turned to social media to express their outrage. The Facebook pages of Michaud, King and Collins all feature angry posts, with some pledging to withhold future votes for the politicians. Veterans’ groups have contacted their delegation offices as part of a national campaign to reverse the cuts. While 1 percent sounds modest to some, he said $125,000 is not small change over a lifetime for a lieutenant colonel. “It has no impact on me at all, but in the military we are a team,” said Ham, who is 71. And as members of a team, he said, veterans never want to see changes that hurt those who followed. Lussier, the public relations officer for the VFW in Maine, said the budget vote will be the No. 1 topic of conversation when VFW members from around the country visit their representatives on Capitol Hill this winter during a conference. “We’re not going to forget about it,” he said.